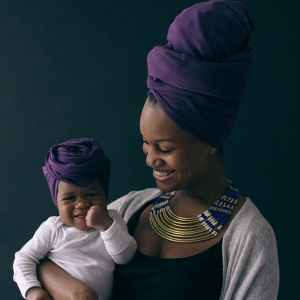 BrandiChantalle is a the Creator of Mama & Me Wraps, a satin-lined headwrap company for Mom & Baby, and a beautiful Queen with a very unique crown. As of January 2015, I have had locs for four years. I started my locs with coils that were about an inch long, and I had at least double the amount I currently have on my head. I’ll give a better explanation later on. How many locs do you have? Have you combined or separated any since you began your journey? I have 54 after doubling the majority of my starter set of locs. I knew that I wanted to have thicker locs from the very beginning of my journey. However, the lady who started mine (chosen because she started my brothers years prior) advised me to wait for my thinner ones to lock before she’d double them up to make thicker locs. But because I know my hair texture, I knew it was going to take a while for them to lock, as is, so after about two or three re-twist I just stopped going to her and doubled them up myself. She also had a lot of questions about why I wanted the thickness I chose (which I didn’t feel like I should have to explain to someone regarding MY own hair), so after doubling them up I never went back, & its been a learning process ever since. I also used to have loose hair that spiraled at the end of my locs. I cut it off because people constantly asked if my hair was loc’d or if it was just twisted, etc. It made me feel as if it had not loc’d (though it had) because they weren’t easily identifiable to others. In hindsight, I wish I had kept them because that’s what made them mine. Two come to mind immediately: a woman named Queen GodIs (@auntiequeengodis). 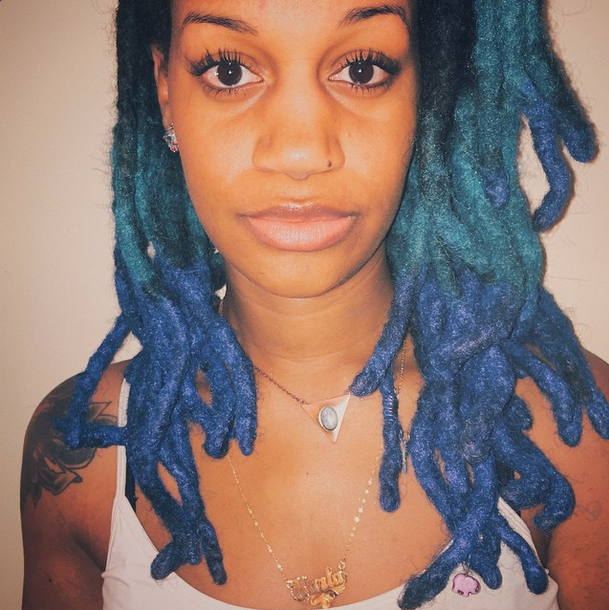 She’s amazing in life, let alone hair, but her locs are beautiful. Because she’s had them for so long, they’ve gradually thinned but they were initially of the thicker variety. There’s also a woman named Rhythm (@rhythmkeene, clearly these names indicate that they’re women I met via the arts). 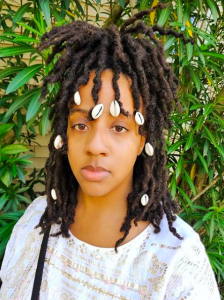 She’s actually sporting the small head, bald head right now – but when I first met her, she had locs that were thicker, and I thought they were beautiful and so different. It didn’t hurt that she also kept a flawlessly polished face before being “beat” was a fad and had this air of mystery about her. I think those two were the people I was most mindful of when loc’ing. There are a host of other people that I might’ve seen in pictures but don’t actually know personally to reference. How often do you maintain your roots? 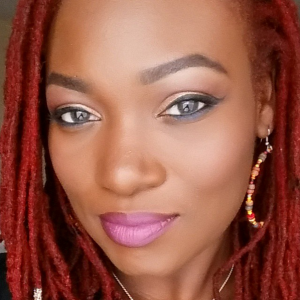 Do you maintain your locs yourself or do you have a Stylist? Aw man. Remember what I said about being happily rasta more often than not? Yeah. Realistically, I usually retwist my hair once every two to three months. Especially since having a newborn. I’m just getting myself on a more consistent day to day schedule, so hopefully the frequency will increase slightly. I’ve had two other people do my hair a handful of times within the last four years for styling purposes. Realistically, I could probably use some help, but I’ve been doing ok as my own stylist. I’ve learned that build up is real. So is sleeping with a scarf. Prior to having locs, I was natural and alternated between a low-cut or fro. However, I was very carefree black girl about both styles and did not do much regarding maintenance when sleeping at night. Coming into locs with that mindset was not the best thing that I could do for my hair. I’ve also learned that despite what retwisting your roots might have you believe, it is great to just let your hair be. Again, I’ve always had that personality or mindset when it came to my hair anyway, but it’s never been more true with locs. People have a tendency to want to see their scalp and constantly have their roots pulled back, but it’s actually served in my best interest (& definitely to my comfort) to rasta it out, more often than not. I also learned that opting for the thickness I prefer kind of equates to a sacrifice in styling versatility because having thicker locs means having less locs to manipulate when creating/trying out different styles. I don’t really have any product loyalty which might account for some of my experience with build up in my locs. I recently learned that mango & lime gel is a great contributor to build up, and because I started my journey pretty independently early on, I didn’t know any different to know any better. Present day, I’m still learning what products work best for my hair, though I have a preference for things that include tea tree or mint. 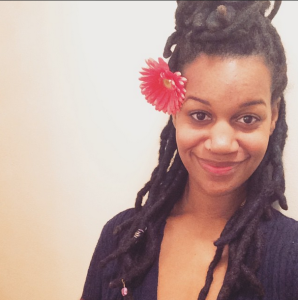 Why did you choose locs? I actually had been natural for 4 years before loc’ing, and I knew I was interested in having them for a long time. I can’t say why specifically, but they’ve always had this majestic appeal to my eyes. 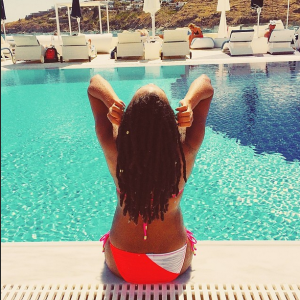 There’s something inherently sacred about locs, in my opinion. 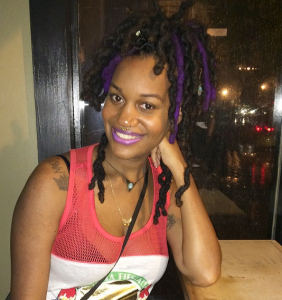 My advice for someone considering or beginning locs is to not be deterred by the commitment. I know a lot of people interested that immediately say they are not ready for something that permanent & my immediate thought is always – 1. They can be combed out (though I wouldn’t think to even try that) and 2. They can be cut off. Granted, I know everyone is not so lax about their hair. Also don’t be afraid to try doing what you want to do or learning what works for you. 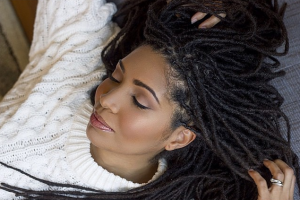 Unless your locs get so thin that they’re just breaking off – whatever you do incorrectly can be repaired by a professional if it comes down to it. 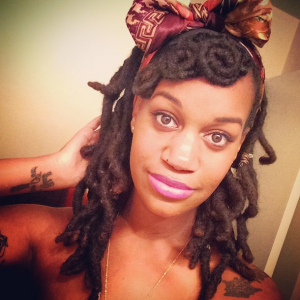 What are some negative connotations you believe people associate with your hair? How do you or would you address them? I feel like the most common association (negative is relative here) is that having locs means I must smoke marijuana. I also feel like it’s assumed that people with locs are dirty. My response to either of those stereotypes is that I am not my hair, and no person is easily defined – by their hair or any other physical mark. Honor your vibe. Be good to yourself. Peace of mind over everything. That’s pretty much what I live by. She has been my inspiration for quite a while! Loveee her IG and beautiful family. Thanks for sharing! I’m interested in starting thick locs with the coils, but haven’t found much info on early maintenance (especially since my hair is pretty long). I’m also in WV, so to my knowledge, loc professionals are few and far between.